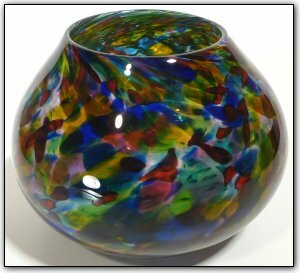 This uniquely shaped multifunctional vessel can function as a bowl or a vase or an urn, and is from the End Of Day® series. This means it was made with a variety of colors used throughout the day, and contains nearly every color in the rainbow on the exterior. The interior is deep and vivid featuring many luscious shades of greens.